To commemorate World Blood Donor Day on 14 June 2012, Muslim Aid Sri Lanka supported a blood donation camp which took place on 17 June 2012 in the eastern part of Sri Lanka village called Muttur which was severely affected during the civil war in the country. The camp was organized by the An Nahla community based organization and facilitated by a hospital based in Muttur. Over 700 people voluntarily donated blood to support their fellow village folk as well as fellow citizen in the country who are in need of various types of blood. The blood donation camp started at 8.30 am and went on until late evening. The donors showed their keen interest to donate as it was first time blood donation camp was organised in Muttur. 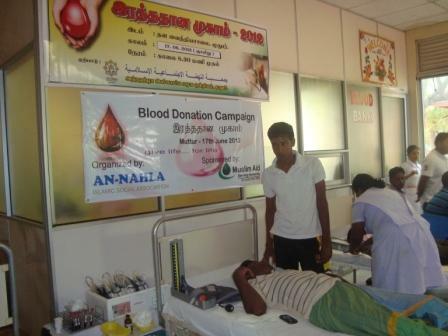 The Ulemas who participated in leadership training organized by Muslim Aid Sri Lanka in 2010 were involved in organizing this blood bank campaign. Five doctors and eight nurses were involved in the blood donation camp. Muslim Aid staff also provided support at the camp including donating blood to show their bond and solidarity with community. Muslim Aid has been working in Muttur since 2004 Tsunami, by providing various supports for sustainable development of the community which includes Peace Bridge (Amman and Arafa Nagar), livelihood support, water supply, Rainbow family programme, ERC and Islamic microfinance etc.